Galerie m is proud to present from May 2 to July 11, 2015, paintings and graphic works by Gotthard Graubner (b. 1930, Erlbach, Saxony in Germany). Ever since his first solo exhibition here in Bochum, in 1977, the work of the painter, who passed away in 2013, has been an integral part of the gallery’s program. 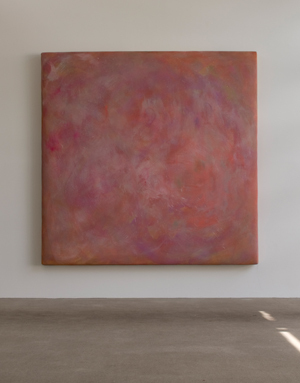 Graubner is best known for his “cushion pictures,” which he referred to as Farbraumkörper, or “color space bodies.” His oeuvre also includes watercolors and etchings, which can be found in major national and international collections such as the Museum of Modern Art in New York. Graubner’s voluminous color space bodies, such as “Piran II” (1986/87), take pride of place in his body of work. After at first including only small padded areas in his pictures, he began in the 1970s to conceive the entire picture space as a colored cushion. However, his engagement with color spaces reaches back to the late 1950s. The exhibition at Galerie m features a very early painting on canvas from 1961 whose nebulous colored areas already spread across the entire picture surface. From the outset, Graubner also took an interest in drawing and printing techniques. On view in Bochum is a portfolio of aquatint etchings from 1976, as well as other etchings in glowing yellow and orange from 2003. He printed the colored areas created by etching the metal plate onto paper using his own gravure printing press in his studio. With their nuanced interplay between light and dark, the etchings develop convincing spatial effects. Common to all the pictures is a spatial depth and the suggestion of motion and dynamics evoked through color. Physicality and spatial presence are of central importance here. Graubner analyzed the interaction of light and color in infinite variations. The broad time span covered by the works in the exhibition illustrates his concentrated dedication to body, space and color as the elementary aspects of painting.